Last week, the world got a glimpse of how Space Exploration Technologies (SpaceX) Chief Executive Officer Elon Musk is using cutting-edge technology from Tesla (Nasdaq: TSLA), his electric car company, to create a spacecraft. At SpaceX's Hawthorne, Calif., headquarters Thursday evening, Musk wowed a crowd of employees, aerospace industry experts, and journalists with the rollout of SpaceX's newest manned space capsule: the Dragon V2. The 15-foot tall, "fire-breathing" Dragon V2 is capable of ferrying up to seven passengers and four tons of cargo to and from the orbital International Space Station (ISS). While focus was on the spacecraft's exterior and engines, the Tesla-inspired interior touch screens also garnered a great deal of attention. The two 17-inch touch screens, which make up the main control space, help the Dragon V2 with precision landing. Musk was quick to boast the screens were taken from the design of the Tesla Model S electric car. "The touch screens are sort of a ruggedized version of what was used in the Tesla Model S so there's a bit of technology sharing there… and the great thing about a 17-inch touch screen… [is that] you can configure the interface to have a wide range of controls and a wide range of feedback, and you can really have almost an infinite amount of information," Musk said. "In the unlikely event of all the screens being destroyed, the critical functions can all be controlled with manual buttons in terms of manual chute deploy and reserve oxygen going to the backup systems for life support." Propelling the new capsule are Musk's new SuperDraco engines. The engines are 200 times more powerful than its current space capsule engines. They've passed stringent qualification testing and will be used on the Dragon V2 to run the Launch and Abort System and to facilitate precision landing. Indeed, no worries of the capsule landing in no-man's land or out in the ocean. According to Musk, the Dragon V2 will "have the landing accuracy of a helicopter." 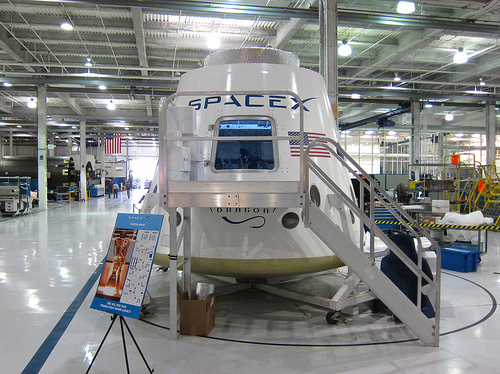 The Dragon V2, a modern-day, sleek version of the Apollo capsules, has been in development for several years with NASA's assistance. Excellent information as usual but terrible eye-straining hard work to read it. Please consider enlarging the text size for articles on this site and changing the colour of the text. Pale grey small text on a white background could not be worse to read!